Scientists on the Dark Energy Survey, using one of the world’s most powerful digital cameras, the 570-megapixel Dark Energy Camera, mounted on the 4-meter Blanco telescope at the National Optical Astronomy Observatory's Cerro Tololo Inter-American Observatory in Chile, have discovered eight faint celestial objects hovering near our Milky Way galaxy. Signs indicate that they, like objects found by the same team earlier this year, are likely dwarf satellite galaxies, the smallest and closest known form of galaxies. The illustration below shows the distribution of the two dozen known dwarf satellite galaxies around the Milky Way. Astronomers have recently discovered nine more additional such candidate objects below the plane of the galaxy, shown here in red. Image Credit: S. Koposov, V. Belokurov (IoA, Cambridge). The main goal of the Dark Energy Survey (DES), as its name suggests, is to better understand the nature of dark energy, the mysterious stuff that makes up about 70 percent of the matter and energy in the universe. Scientists believe that dark energy is the key to understanding why the expansion of the universe is speeding up. To carry out its dark energy mission, DES takes snapshots of hundreds of millions of distant galaxies. However, some of the DES images also contain stars in dwarf galaxies much closer to the Milky Way. The same data can therefore be used to probe both dark energy, which scientists think is driving galaxies apart, and dark matter, which is thought to hold galaxies together. Scientists can only see the faintest dwarf galaxies when they are nearby, and had previously found only a few. If these new discoveries are representative of the entire sky, there could be many more galaxies hiding in our cosmic neighborhood. View the Dark Energy Survey analysis online here: http://arxiv.org/abs/1508.03622v1. Follow the Dark Energy Survey on Facebook and Twitter. For images taken with the Dark Energy Camera, visit the experiment’s photo blog, Dark Energy Detectives. The Dark Energy Survey is a collaboration of more than 300 scientists from 25 institutions in six countries. Its data is processed at the National Center for Supercomputing Applications at the University of Illinois at Urbana-Champaign. The Hubble image shown at the top of the page in green and infrared wavelengths, is dwraf galaxy NGC 5477, a beautiful, glittering cluster of stars. 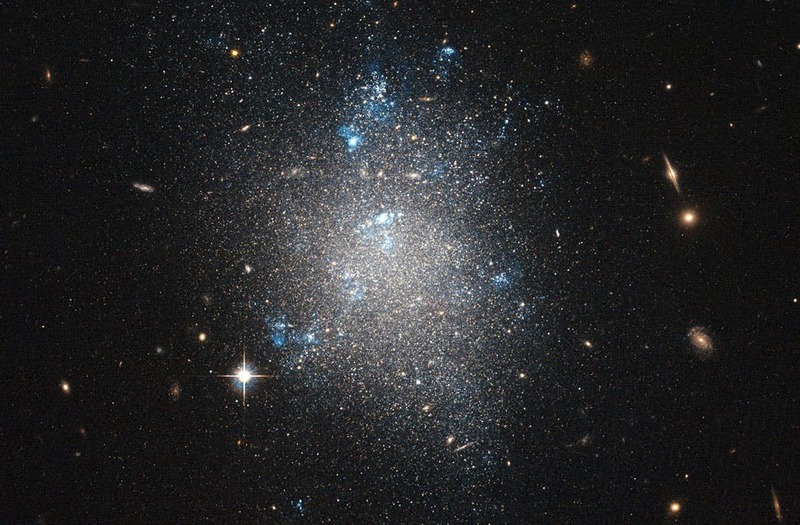 It’s a dwarf irregular galaxy located 20 million light-years away within the Messier 101 group, a loose gathering of galaxies in the constellation Ursa Major (part of which includes the asterism of the Big Dipper, or Plough.) The group is dominated by Messier 101 — the Pinwheel Galaxy, an enormous spiral galaxy 70 percent bigger than the Milky Way. The bright blue and white blotches scattered throughout NGC 5477 are nebulae, clouds of hydrogen gas that are condensing to create new stars. In optical wavelengths they would appear dusky pink. Found! 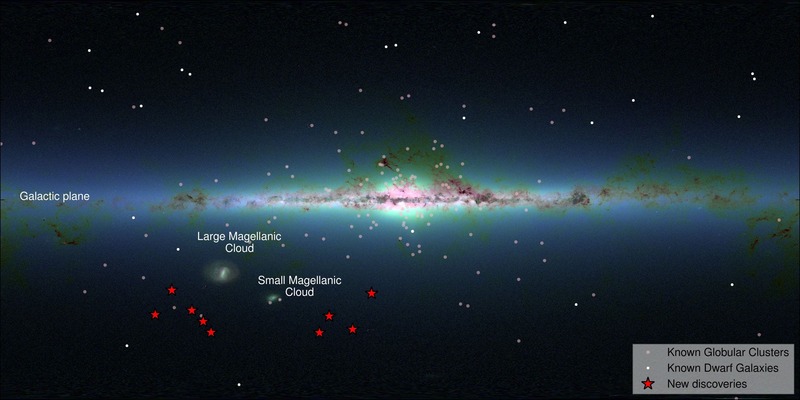 "The Missing Piece in a Long-Standing Milky Way Puzzle"